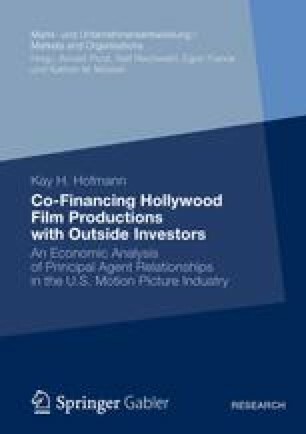 The work at hand set out to investigate principal agent relationships between the major Hollywood studios and two specific types of co-financing partners. Based on regression analysis performed with a hand-collected recent database of U.S. motion pictures, I provide empirical evidence for the often reported underperformance of co-financed motion pictures and identify multiple agency issues as the underlying causes. Along these lines, this dissertation is also an empirical test of the predictions of the principal agent theory. The results suggest that notable differences between the two co-financing regimes exist.